Here’s a couple of drawings of the farmhouse as it is today. The second drawing shows the property in less detail, but labels up the different parts that go to make up the building. You will find photos of the property here. The cottages were originally three cottages (8, 9 and 10 Hagg Leys). It was only in the 1990s that numbers 9 and 10 were converted into one property – known as 10 Hagg Leys today. We plan to join all three cottages together and connect it to the barn. The barn is a simple construction with a sloping corrugated roof. There are two floor levels inside the barn. The lower floor level is probably at about the same level as floor level inside the cottages themselves. 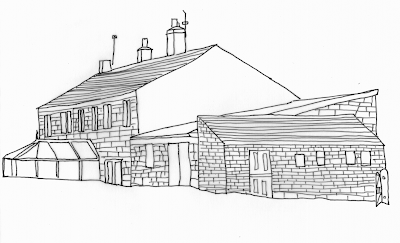 The current plan is that the barn will form the corner of an extension that will be at a right angle to the existing cottages. Thus forming an “L” shape. Attached to the barn is another building with a lean-to roof. This time the roof is made up of stone tiles. 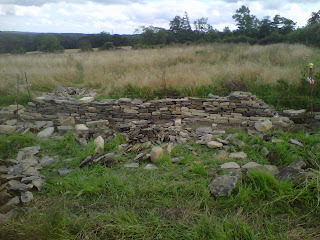 It is believed that this building was used to prepared food for animals. For want of a better label, I have called this the “piggery” since we believe that the food prepared here was destined for pigs. This building is likely to be demolished as part of the renovation and wherever possible the materials reused elsewhere on the site. How accurate is measuring using Google Maps? Well, now I have an accurate set of floor plans, I can compare the estimates that I worked out using Google Maps (see previous post). I estimated the overall size of the buildings (including the barn) to be around 20 feet by 80 feet. The floor plans (and the topo survey) show that the building is in fact 22 feet by 82 feet. Remarkably close to the Google Map estimate. I tried a few other measurements that I had taken and they are all within about 10% of the actual measurement – this is particularly the case with longer measurements. It is pretty scary about how much detail you can glean from these satellite images. 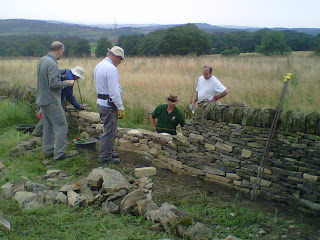 I attended an intro course in dry stone walling at the weekend run by the Yorkshire Dry Stone Walling Academy. http://ydswa.com/. 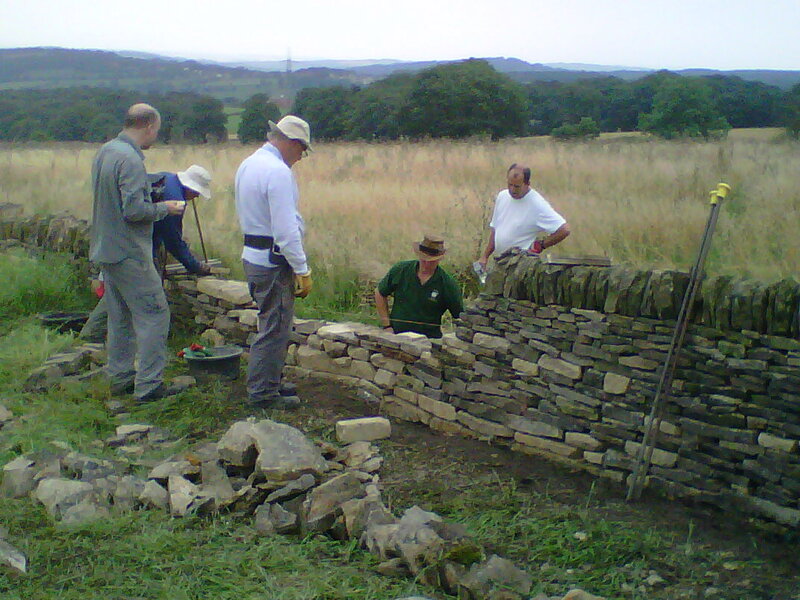 It was held at a farm on the way to Barnsley and was about a 20 minute drive from where we are in West Yorkshire. So pretty convenient. I now know how to strip a wall down, sort out new foundations and build a new wall. It was pretty hard going and the weather was hot – I drank nearly 2 litres of water on each of the days. I can still feel the effects of a couple of days hard labour! However, it was good fun and I think I learnt an awful lot. If nothing else, I now have an appreciation of the amount of effort that goes into building these walls! 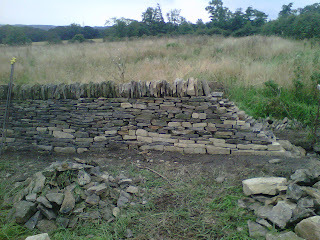 This is my bit of the wall – the overall wall was a group effort – I worked the bit of the right hand end of the wall. There were 7 of us on the course with two instructors. It is far from perfect, but not too bad for a first attempt. 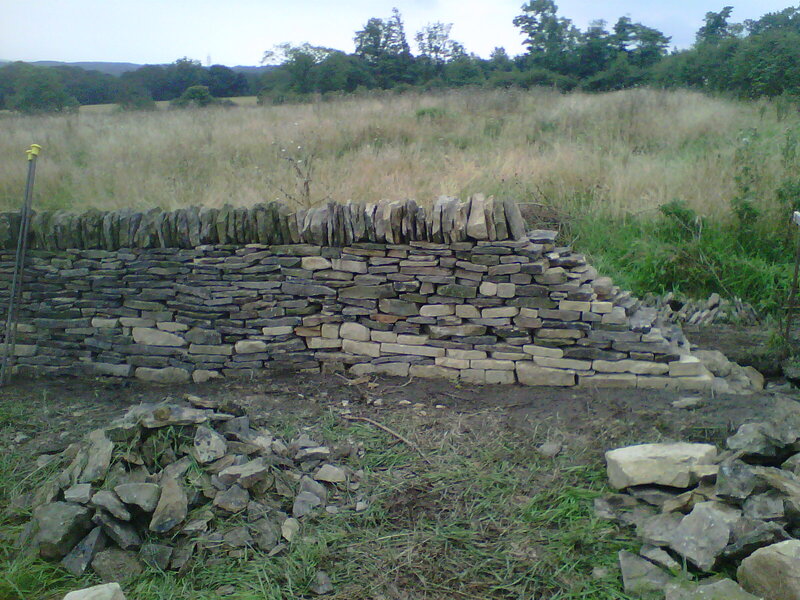 I reckon with a bit of practice it would be possible to complete about one metre of wall per day. So how many metres of wall are there in the new property? 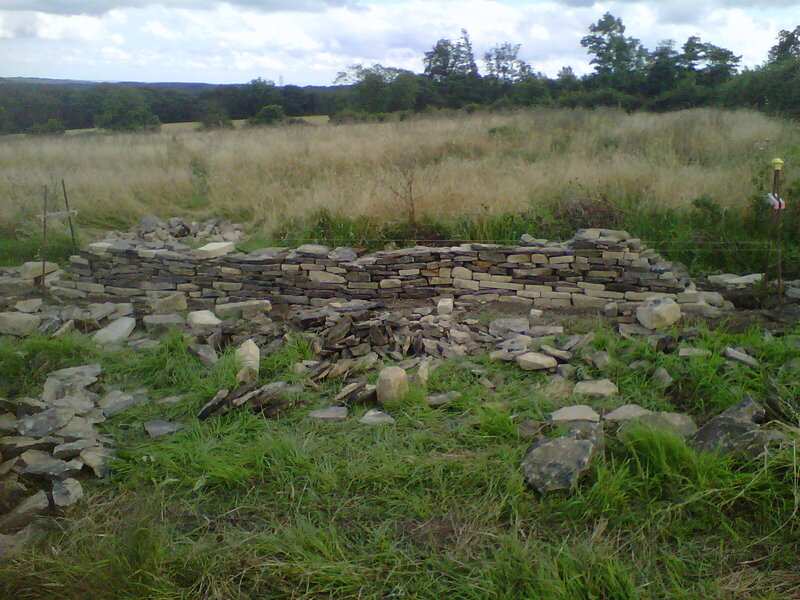 I reckon (using good old Google Earth) that there is around 500 metres of dry stone wall on the property – about 400 metres is in good shape requiring a little bit of repair here and there, but about 100 metres needs totally rebuilding. I don’t have a more accurate estimate at this point, since I have had more important things to look at up until now. Even so with a 100 metres of wall to rebuild that is potentially 100 days work – or 5 months full time. Mmmmm. Here’s some more photos from the weekend. I would highly recommend the course. And all for £75. At the end of the first day. We have made some progress over the past couple of weeks. The topographic survey was conducted a couple of weeks ago and we now the results. 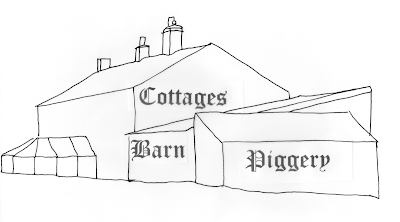 It is a very accurate plan of the cottages, the outbuildings and the surrounding ground. The surveyors installed a number of anchor points and then measured everything from these. The end result is a very large plan of the property and the surrounding areas. We also had a comprehensive internal survey completed. From this, we now have an accurate layout of all the rooms, windows and even wall thicknesses. This will be used as the basis for the plans for the new renovation. The plans of the current building will also include the front and side elevations. I have both of these plans printed out on large sheets of paper, but I don’t have these electronically at the moment. More when I have more information electronically. Update: I now have electronic versions of the material and have uploaded them to other posts on the blog. You will find the existing floorplans here, the topographic survey here, and the elevations here. The results of the Bat Survey are in! Although we are still waiting for the written report, it would appear that we don’t have a problem with bats. 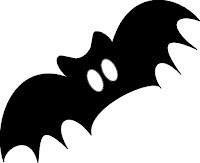 The assessors have confirmed that there are no bats living in any of the buildings and while the survey did reveal bats foraging in some of the tress. They only recorded one bat during their time (around 3 hours) on site. As soon as we have the written report, I will post more information. I spent a very frustrating afternoon in the Deeds Registry in Wakefield trying to find out more information about our property. I had high expectations, but it wasn’t to be. Last time I did some research on local history, I got a result in 30-40 minutes. But this time, I spent all afternoon and got nowhere. From the census, I knew that at least one of the properties was occupied by Hobsons from 1851 through to 1911 (which is the last available census). 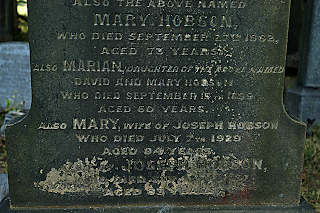 We had already found the Hobsons gravestone in Honley Cemetery, so I was assuming that they might have owned the property. But alas no. I searched all of the deeds registers and there are no entries for David Hobson. 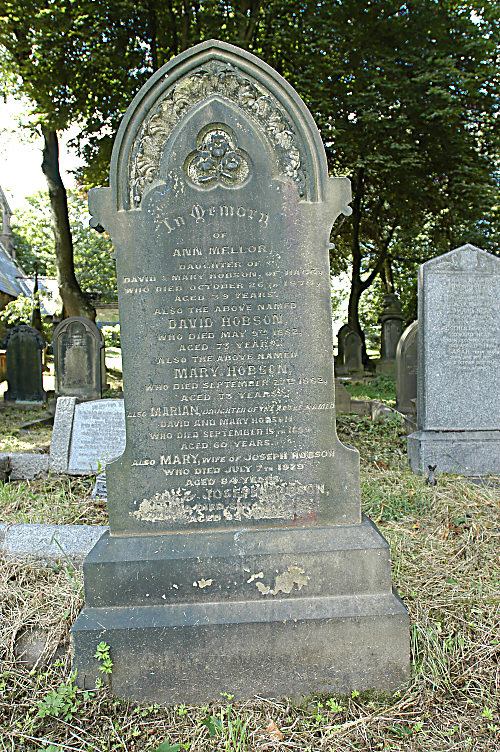 In fact, there are no entries under David Hobson (any David Hobson) in West Yorkshire between 1819 – 1919. Spooky. There are lots of entries for Hobsons, but none for David Hobson. 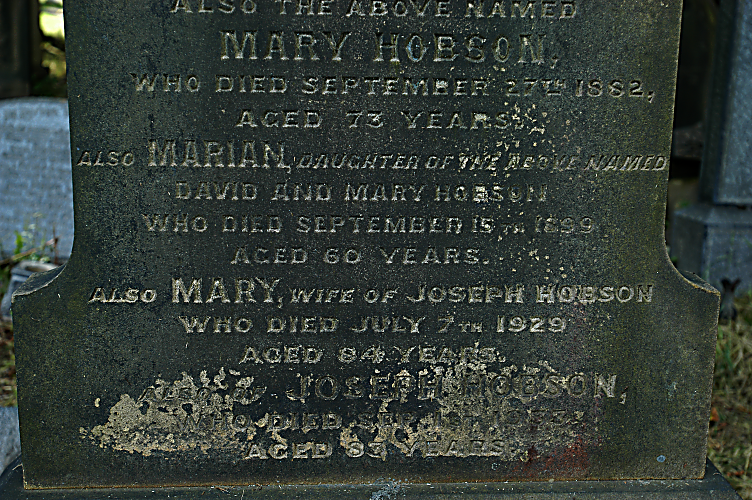 I did find some entries under Joseph Hobson, but none of them were the correct Joseph Hobson (or in the wrong area). I searched under the names of the other occupants that featured in the Censuses, but again no luck. So I can only surmise that the occupiers did not own the property, but rented them (don’t forget that they are organise as three separate cottages). Time to change tack. In 1910, there was a national land survey conducted to establish who owned each plot of land in the UK. We quickly found the appropriate map in the archive. Luckily, the map we were looking for was there – the Archive do not have copies of all of the maps. The map shows that all the cottages and the land surrounding it is owned by the same person – referenced on the map as “1010”. Unfortunately, I then ran out of time before I could look up the reference number in the catalogues. Ho hum. It will have to wait for another day. But at least we do know that all the cottages and the surrounding land were owned by a single person in 1910. It is a start. PS The staff in the Registry of Deeds are really helpful and sure know their way around. More information here: http://www.archives.wyjs.org.uk/archives-wakefield.asp. Check the opening times if you want to visit (it is closed at lunchtimes 1-2pm) and I would suggest making an appointment before visiting. We have always been aware that there is a mobile telephone mast in the woods above the property. I realised it was more than a mobile phone mast when I saw the deeds providing access to the mast on behalf of the IBA. The mast is a few hundred meters from the property and is largely obscured by the woods (certainly in summer with leaves on the trees). And I guess the other thing is that by the looks of the map above, we should get great reception of digitial TV. Strangely I have looked through all the photos of the property that we have taken and none of them have got the mast in shot. When I was looking into how old the property was, I used some of the old maps in the Local History Unit in Huddersfield Library. I have a photocopy of the oldest one that has our property on it – 1788. The map is well out of copyright so the library was happy for me to photocopy it. I then wondered about whether old maps ever appeared on ebay. And the answer is yes. I found a couple of old maps that show the property – one from 1901 and another from 1938. The scale on the 1901 map was a little small, but the 1938 map clearly shows the property. I purchased both maps – £3 for the 1901 map and £12 for the 1938 map. There are both copies of the originals. I spotted the one of the sellers had a 1:2,500 map of the area, but unfortunately our property was just off the bottom of the map. I sent them and email enquiry if they had the adjoining map. No luck, but I do now know the map number that I am looking for! The vendor (Chris @ Wealden Relics. See the ebay site here) pointed me in the direction of www.old-maps.co.uk. This site allows you to search on a postcode and then view a number of old Ordnance Survey maps of that location. The 1:2,500 maps are the most detailed and the most useful. There are a number available showing our property over the years. The maps are a little on the expensive side, but you can get a lot out of the site without having to purchase a map. Found it! The graveyard was a little overgrown, but this end of the graveyard seemed to have been cleared recently. 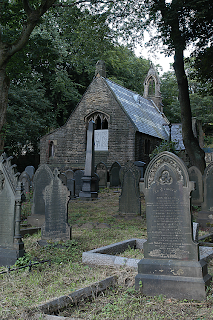 The building in the background is not the church, but the chapel mortuary – one of very few to be found in West Yorkshire. It is boarded up and largely derelict now. 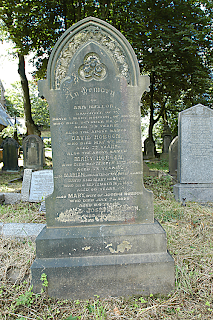 The Hobson’s gravestone is the one to the right of the photograph. 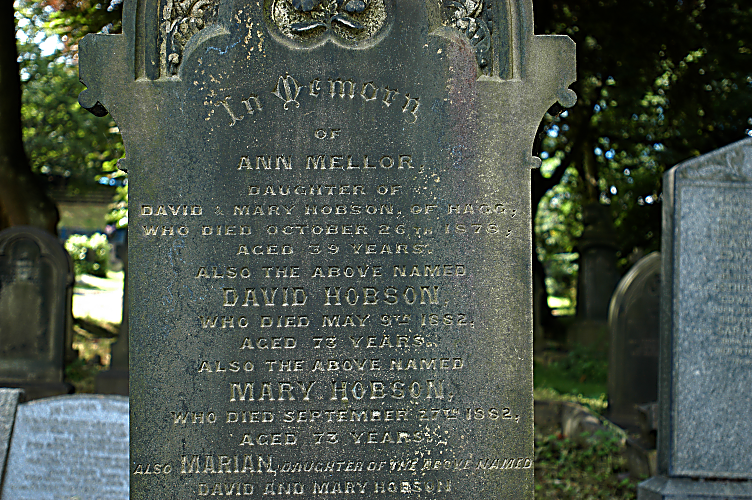 David and Mary Hobson are buried here together with their daughters Ann (Mellor) and Marian, their son Joseph and his wife Mary. David and Mary lived in the property from at least 1850 through to the deaths in 1882. Joseph and Marian (their son and daughter), who were both born in the property, lived there until at least 1911 (their latest census records that are publicly available). Joseph died in 1933, Marian in 1899. Presumably reusing the plot and the gravestone saved on the costs. When I first started looking into how long the property was, I spent a little bit of time in the Local History Unit at Huddersfield library. Quite quickly I established from the 1901 census that the property (10 Hagg Lane as it was referred to then) was occupied by Smith and Mary Littlewood and their three children (Ernest, Wilfred, and Denis) and a step daughter Evelyn Eastwood. Their occupations were listed as Woollen Weaver. The property next door (9 Hagg Lane) is occupied by a 50 year old farm labourer, named Joseph Hobson. Originally, I used the microfiche in the local library to view this information, but I have subsequently accessed it online. Although there is a charge, you can access the information from here: www.1901censusonline.com. There is no 8 Hagg Lane listed on the 1901 census although, 8, 9, and 10 Hagg Lane are clearly shown on many of the old maps (including the 1977 OS version). Strangely enough, there are only two properties present today number 8 and number 10, but not number 9 and number 10. This illustrates part of the problem with using the old censuses, particularly in rural areas – the numbering of properties is a fairly recent occurrence (since Victorian times) and it can be difficult to work out which properties are which. For example, there are no numbers on the censuses for this property before 1891. You have to use some intelligence and work out which way down the road the administrator was travelling as he filled in his census forms. In the 1891 census, the properties are identified as “Cliffe, Hagg Lane”. I am assuming that the “Cliffe” refers to the bit of crag in the bottom field that can be seen from the road. The 1851 census lists the property as “Middle Hagg”, presumably on the basis that it is between Upper Hagg and Lower Hagg. Anyway, back to Joseph Hobson who lives in 9 Hagg Lane in 1901. He is recorded as living in the property in 1861 as a “scholar” 16 years old with the rest of his family. 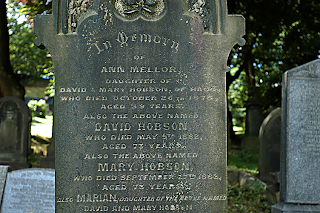 His parents are David and Mary Hobson (both born in 1809). His father’s occupation is listed as “Farmer of 6 acres”. His father is born in Honley and his mother in Farnley Tyas. So the next thing I wondered about was whether I could find out where they are buried. I had a quick look at the map and worked out where the nearest churches and grave yards where. One in Netherthong (I know this church dates from around 1820) and another in Brockholes (dating from around the same time). I had a quick look in both churchyards, before searching online. A quick search online showed that there is a graveyard in Honley. Furthermore, the burial entries have been digitised and are online. Surely I won’t find the Hobson’s? Bingo. Section 30, plot 2269. You can find the website site here: http://www.honley.ukf.net/ Although, it hasn’t been updated since 2003, it had all the information I was looking for. Well, you know what I am going to do next – yep, look for the gravestone.